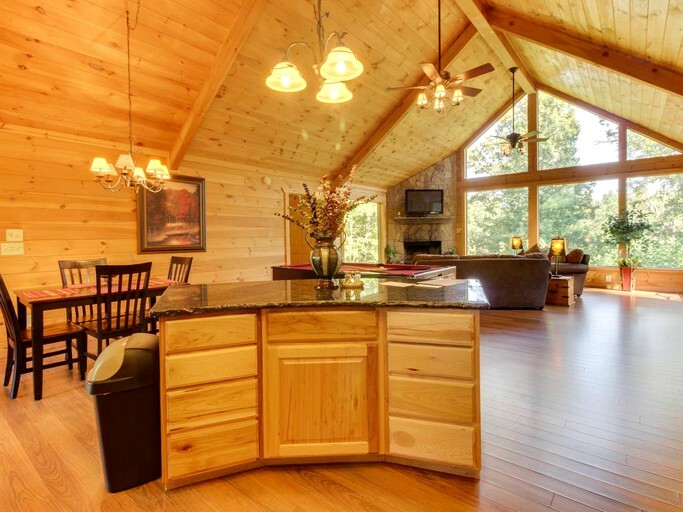 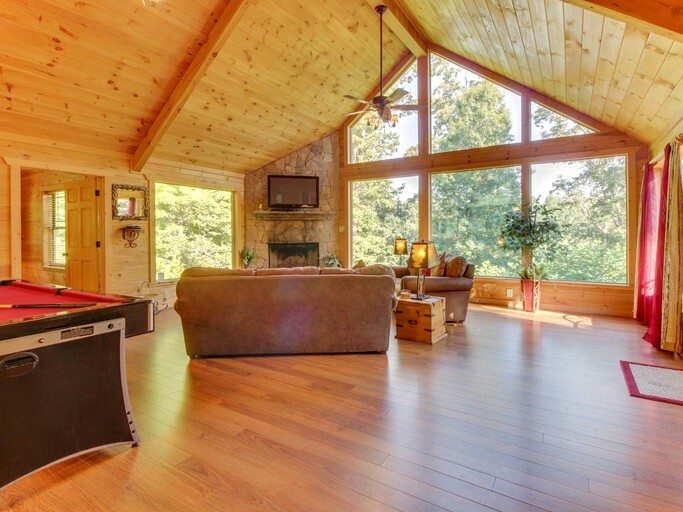 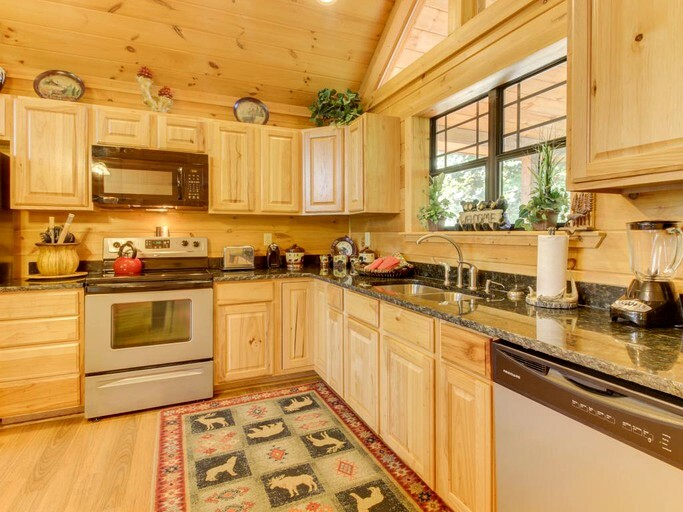 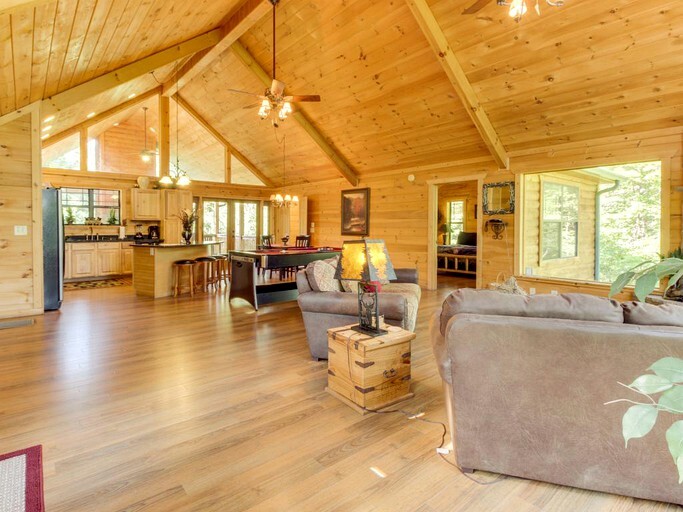 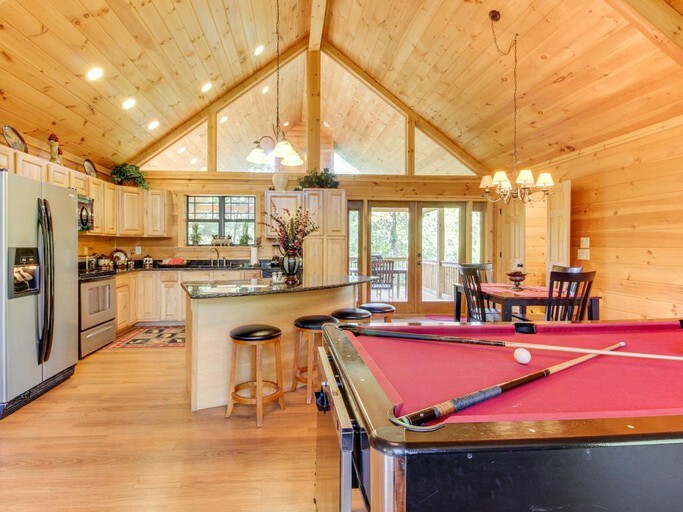 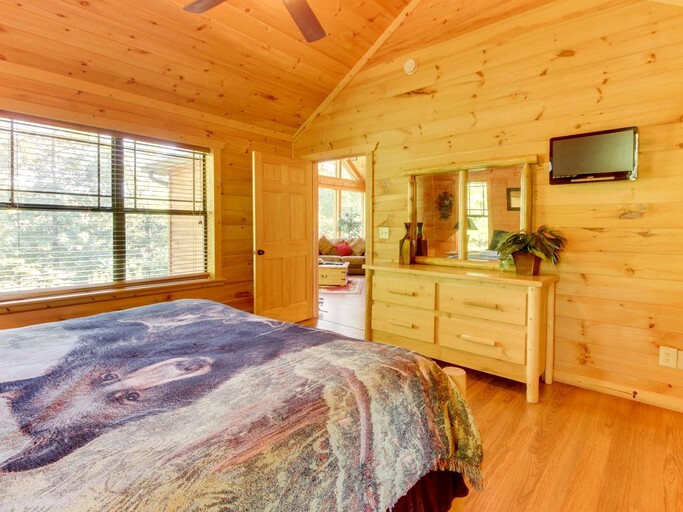 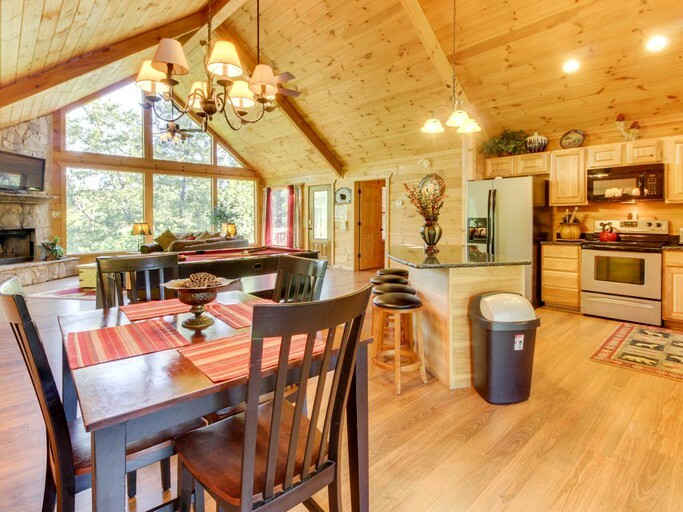 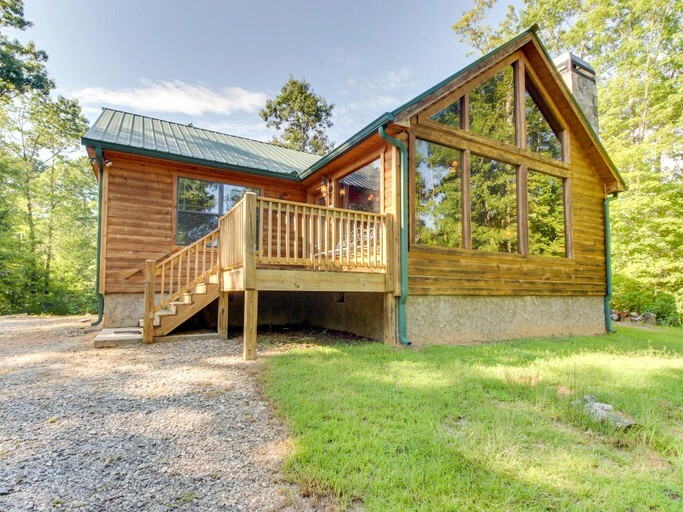 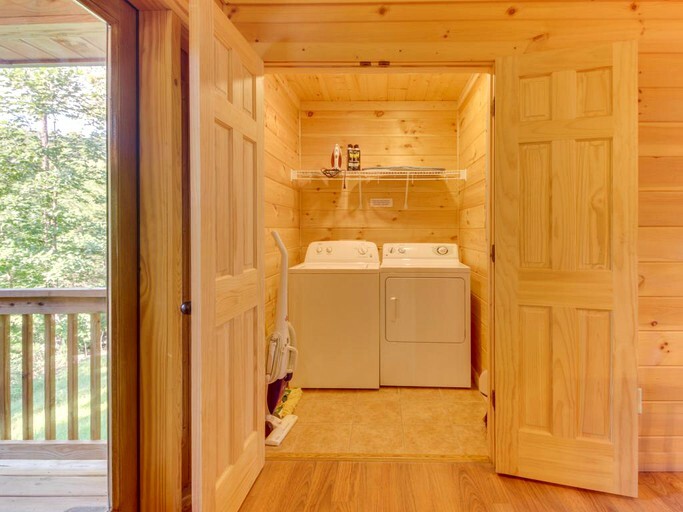 This luxurious, dog-friendly cabin located near Helen, Georgia, boasts upscale décor, high ceilings, plenty of natural light, and giant windows with forest views. 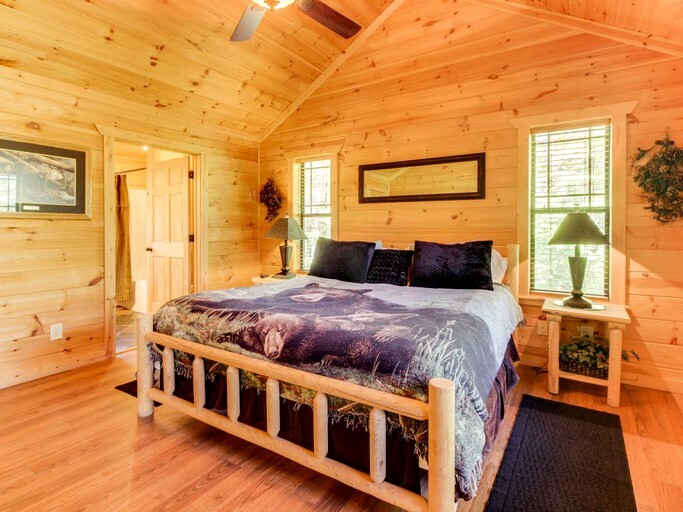 This all-wood cabin can sleep up to four guests, which makes for a perfect romantic or small family getaway. 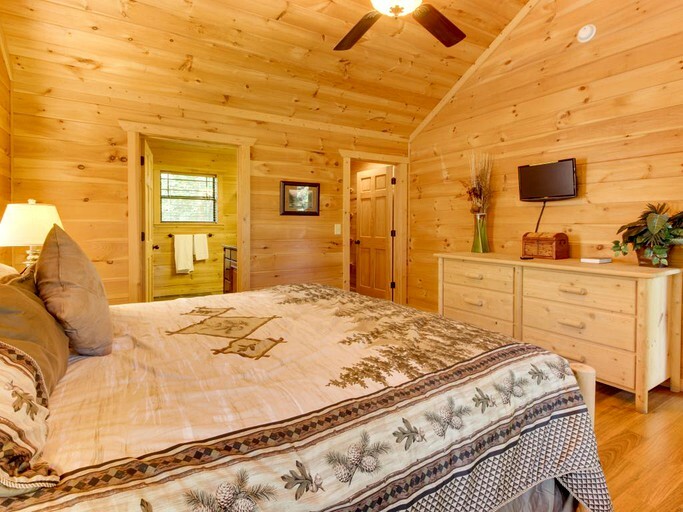 The two bedrooms are furnished with king-size beds with animal bedding and both include ensuite bathrooms. 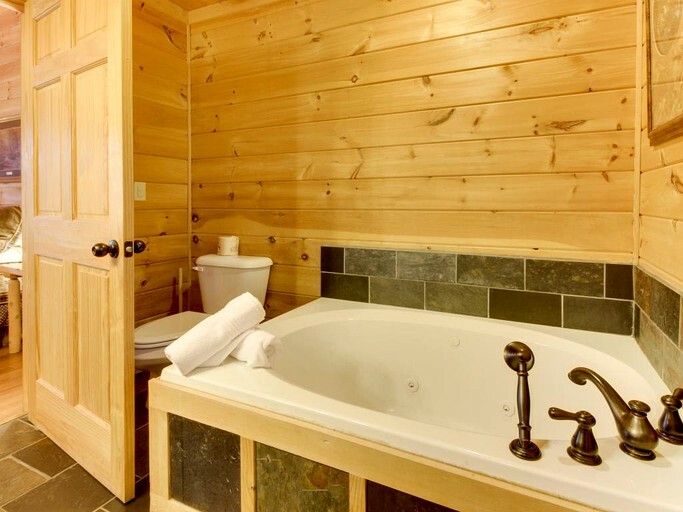 One of the full bathrooms features a jetted tub and a flat-screen TV. 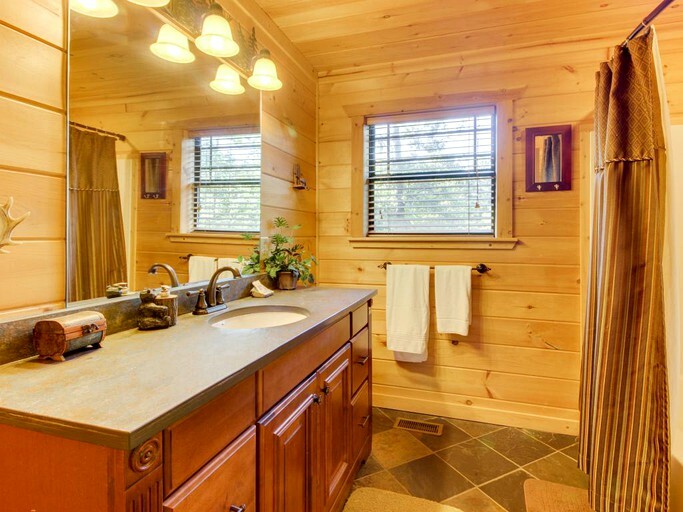 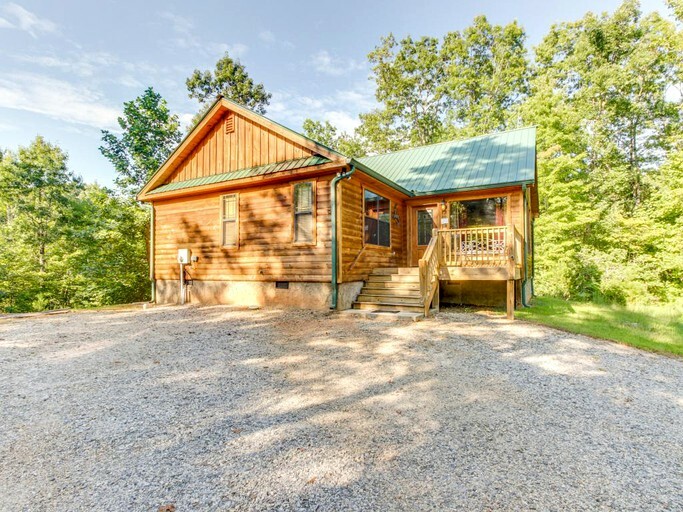 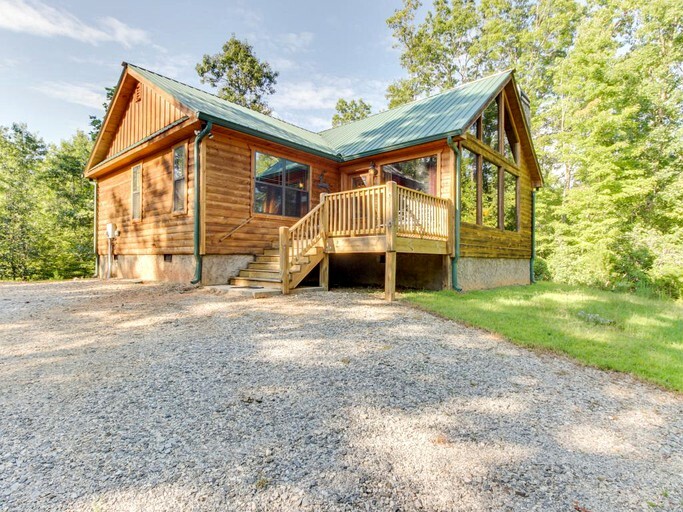 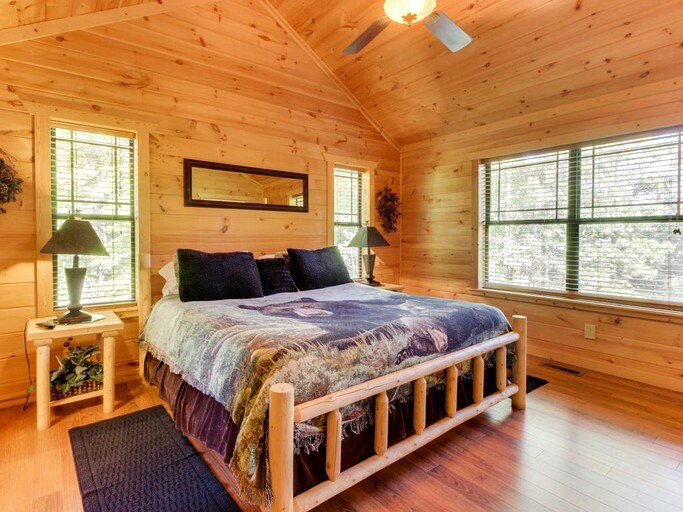 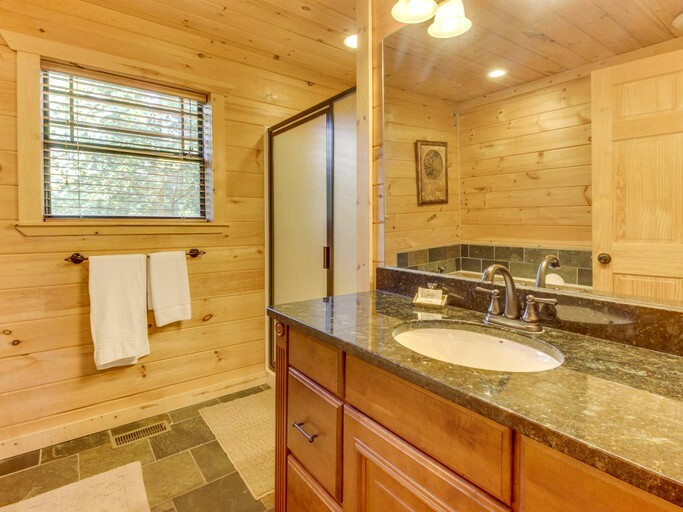 This upscale cabin boasts high ceilings, stunning woodwork, and giant windows with forest views. 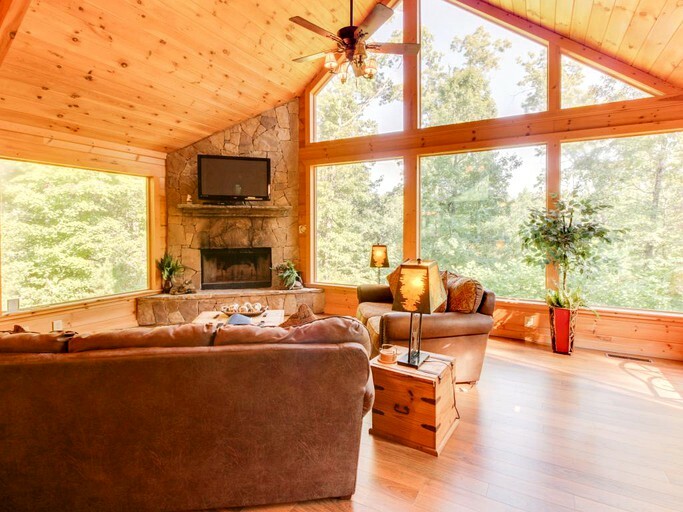 The interior is warm and inviting and offers plenty of natural light. 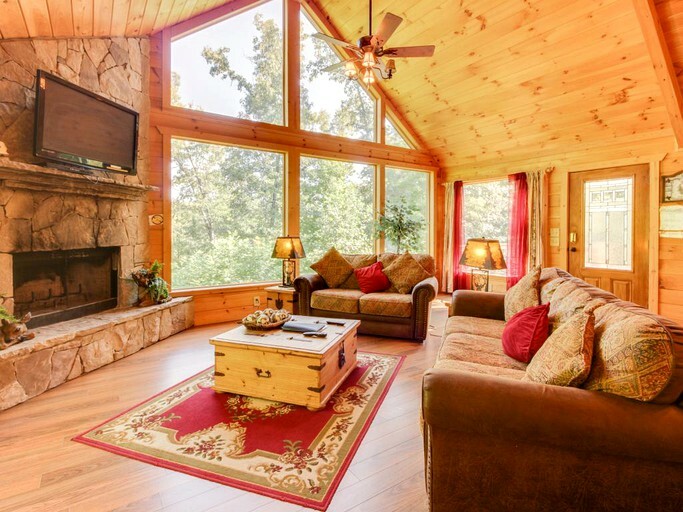 The living room features two comfortable sofas, a flat screen TV and DVD player, and a wood-burning fireplace. 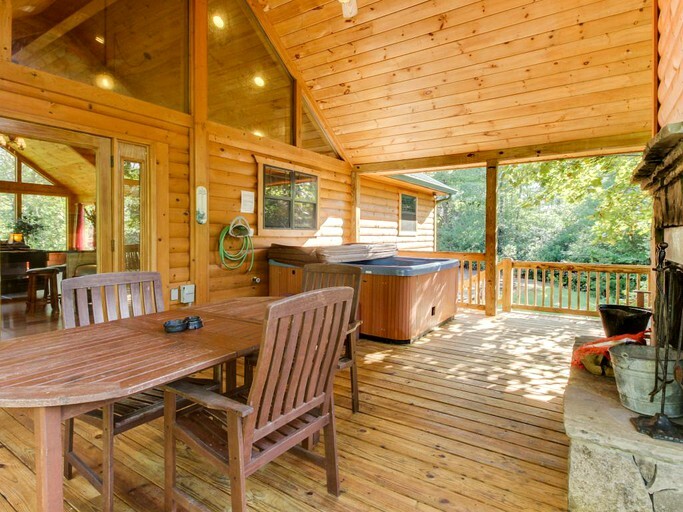 With two bedrooms, this glamping site can sleep up to 4 guests. 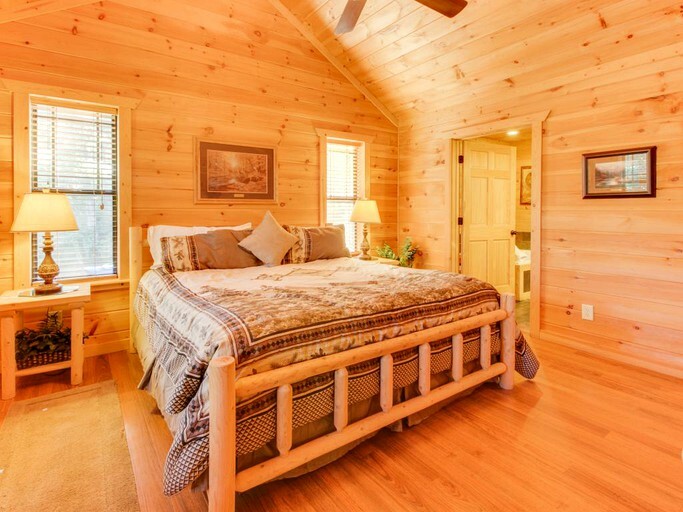 Both bedrooms are furnished with king-size beds with animal bedding and include en suite bathrooms. 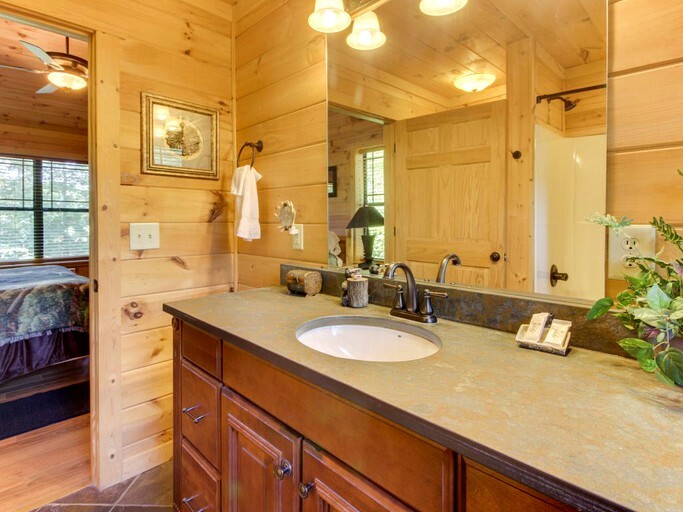 One of the full bathrooms features a jetted tub and a flat screen TV. 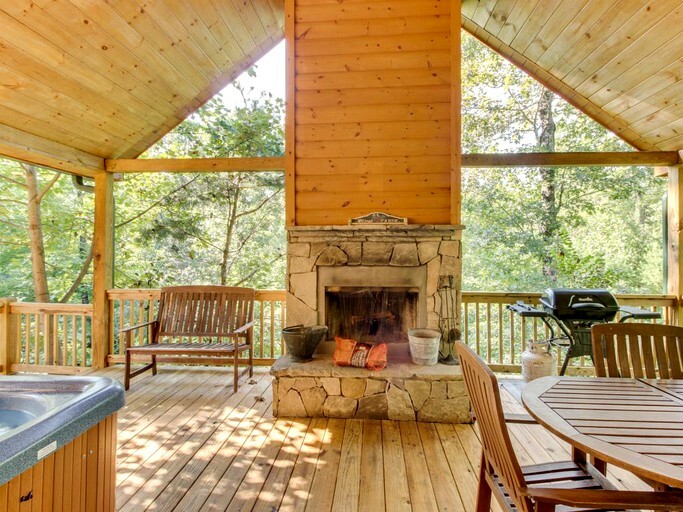 WiFi is available on the property. 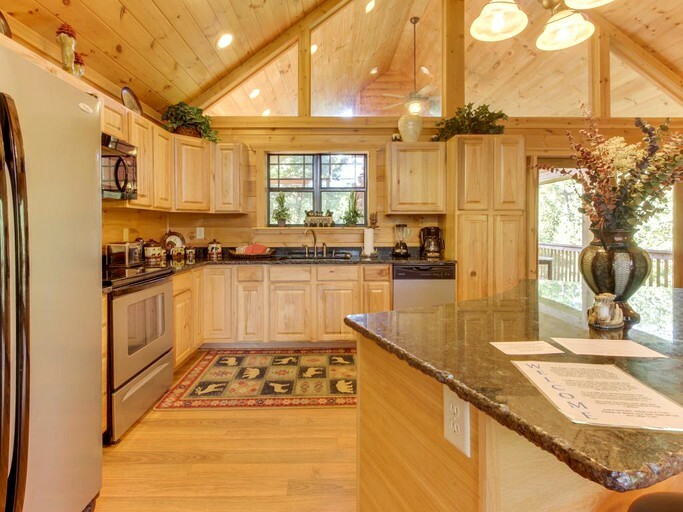 The fully equipped kitchen features stainless steel appliances, a dishwasher, ample counter space, and an island that seats four. 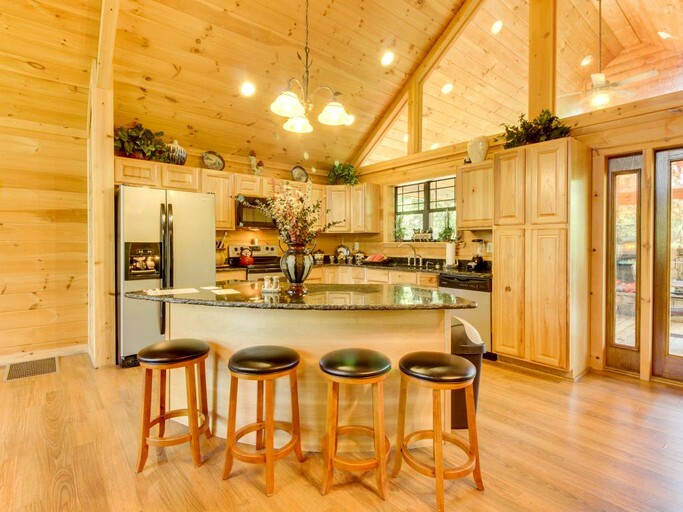 An adjacent dining table seats an additional four. 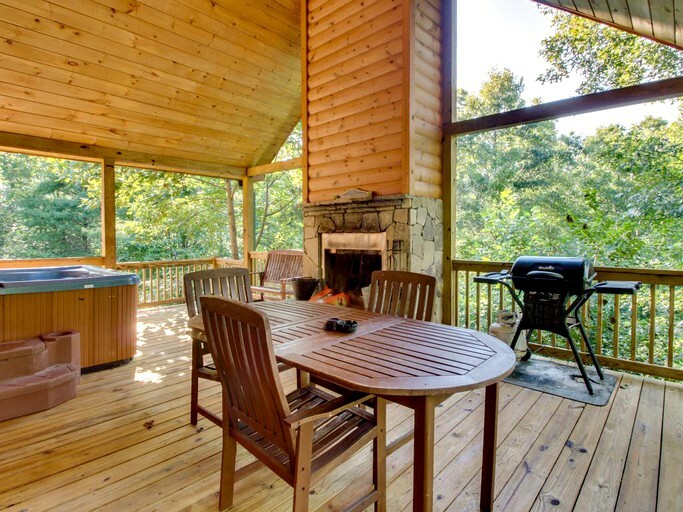 The covered deck, which includes plenty of seating space, features a wood burning fireplace, a gas grill, a hot tub and incredible views. 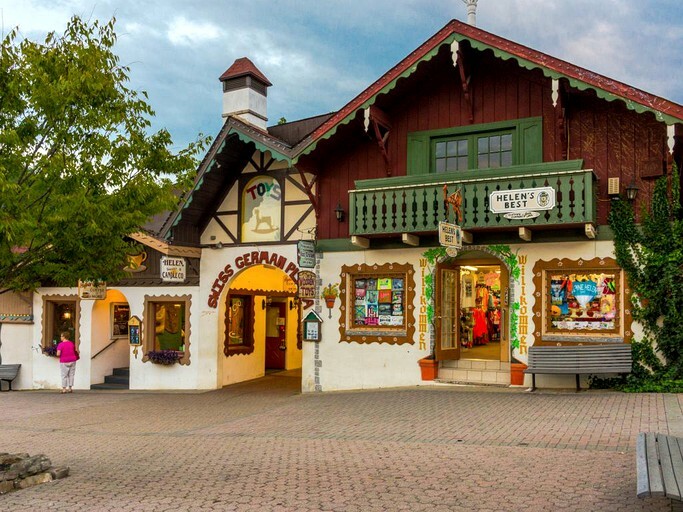 The German town of Helen is a perfect place for shopping, sightseeing, and wine tasting. 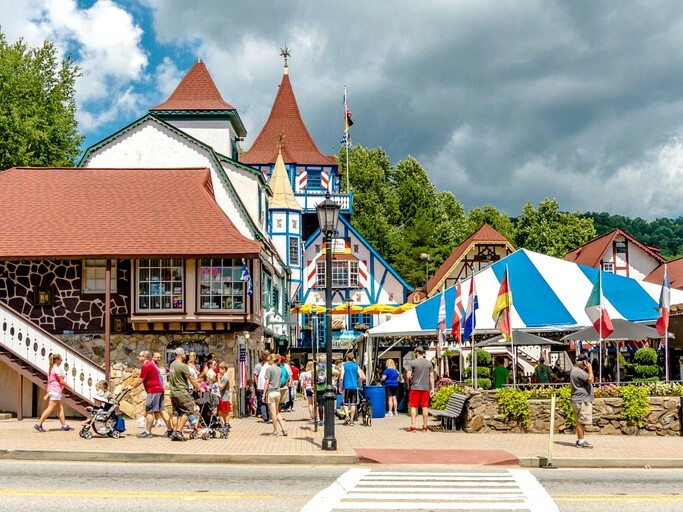 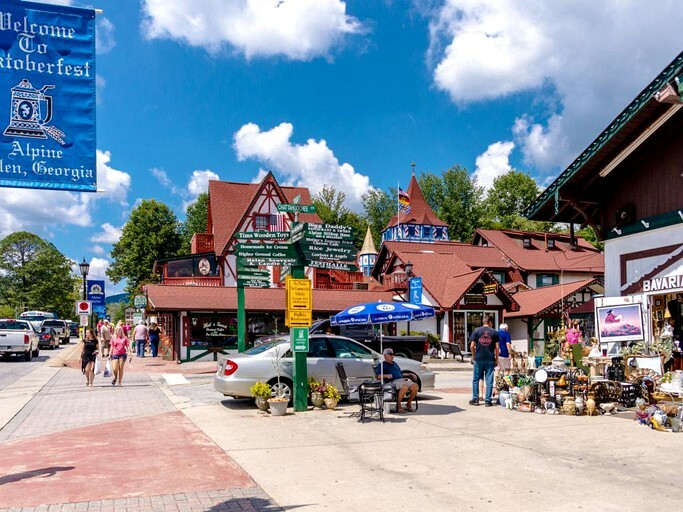 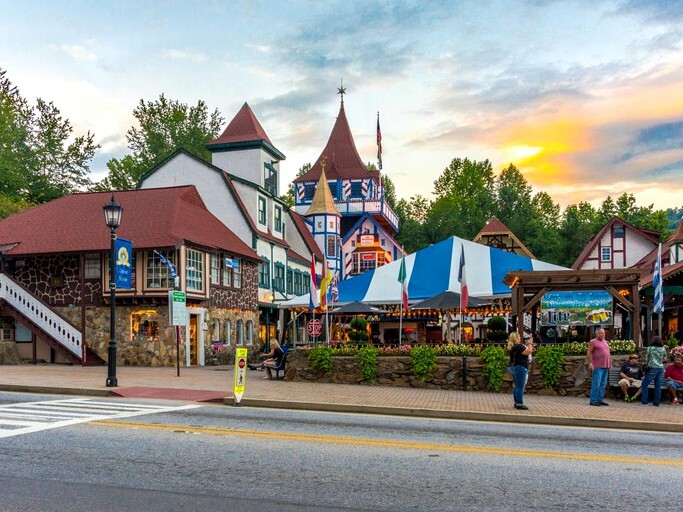 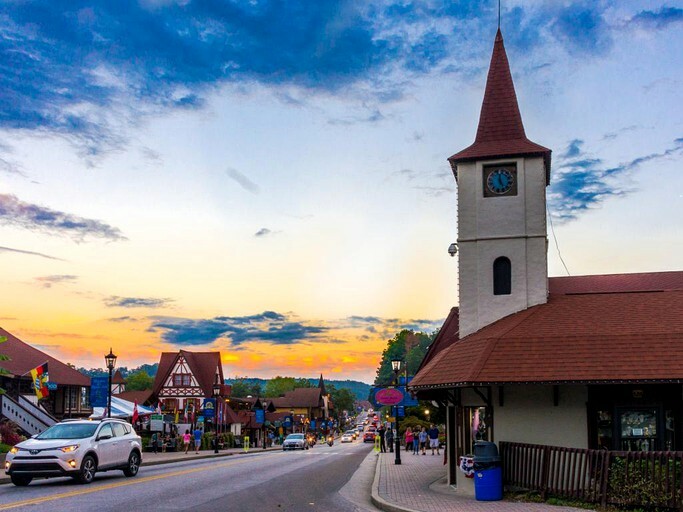 Those visiting in the fall can attend Helen´s town-wide celebration, Oktoberfest, and enjoy endless eating and drinking. 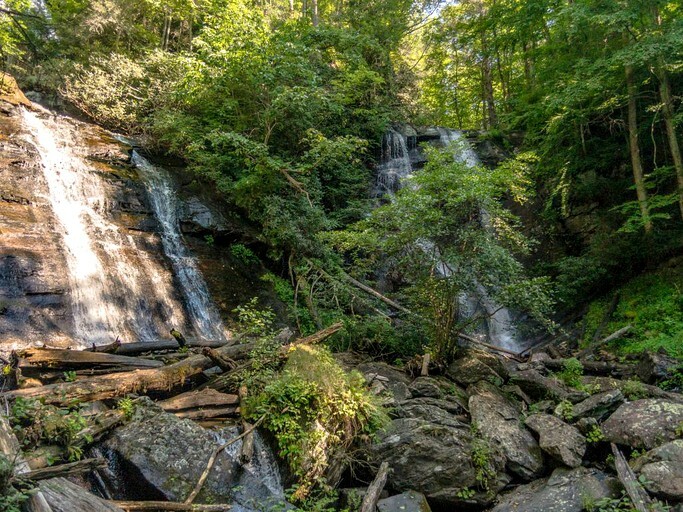 There is an overwhelming number of hiking trails with cascading waterfalls and incredible scenery throughout the Chattahoochee national Forest. 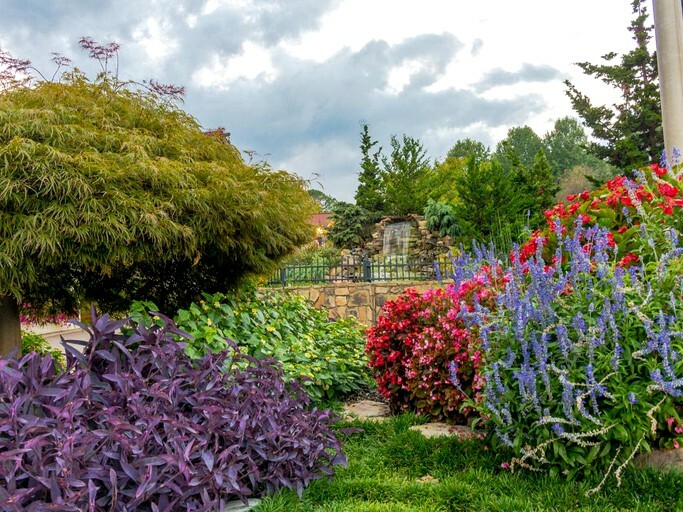 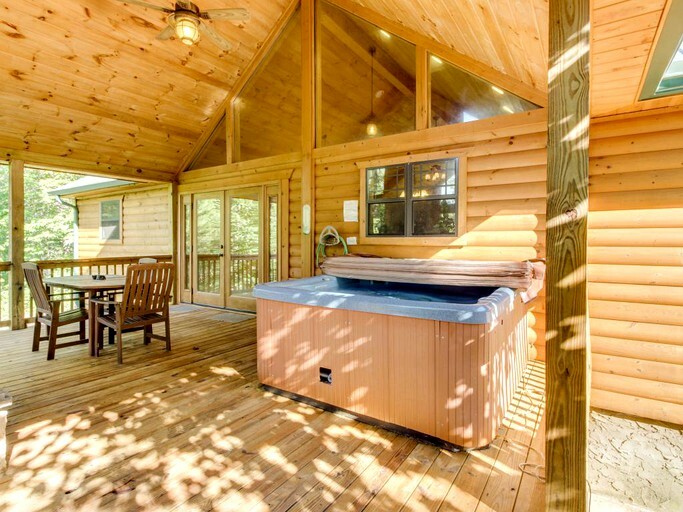 Guests can go hiking, mountain biking, rock climbing, and fishing, or enjoy the relaxing experience of floating down the Chattahoochee River. 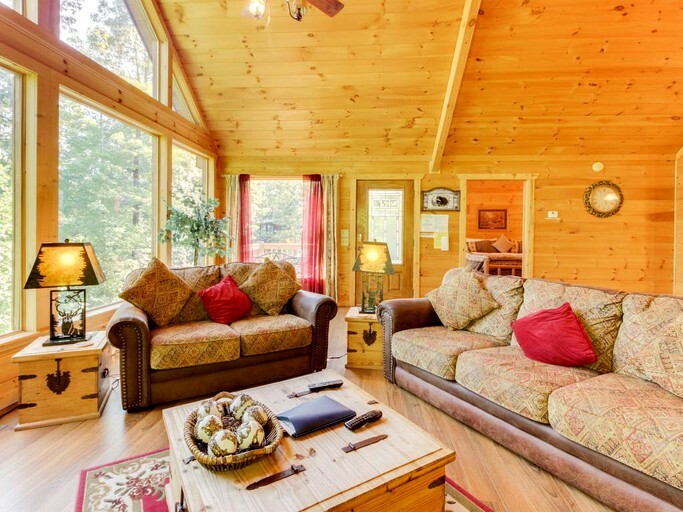 The cabin offers guests a luxurious retreat after a day of outdoor adventures. 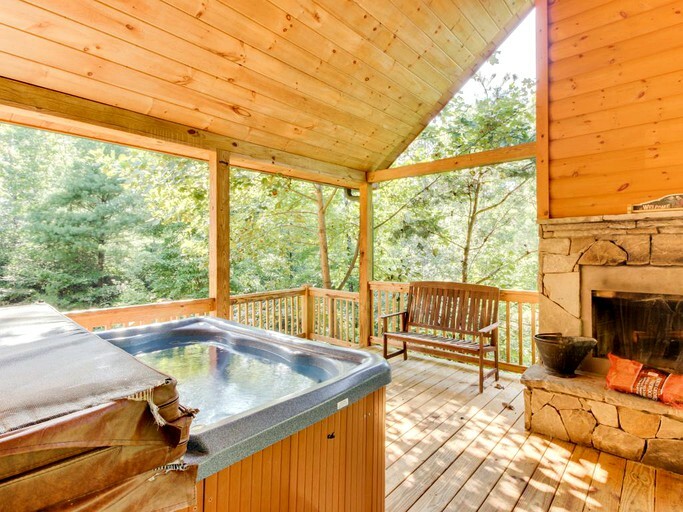 Soaking in the hot tub on the covered deck is a great way to relax, unwind, and enjoy the breathtaking views. 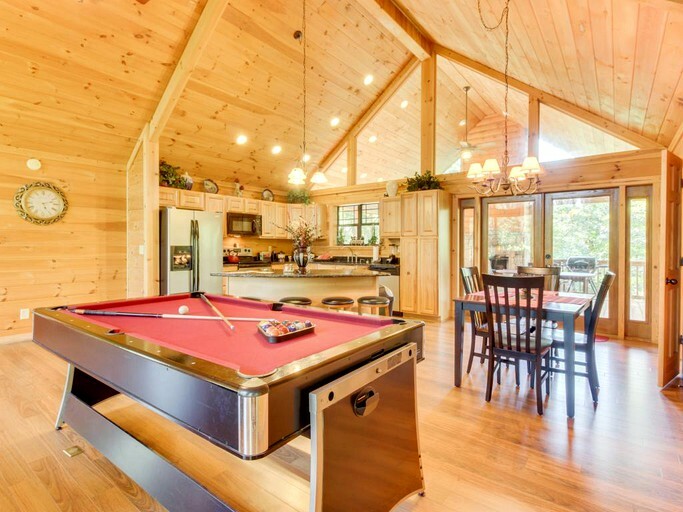 After a lovely dinner next to the wood burning fireplace on the outdoor covered deck, guests can retreat back inside for a game pool. 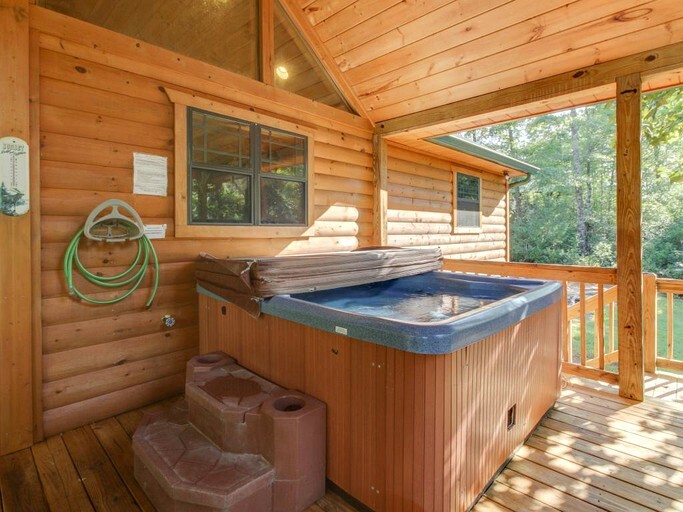 Maximum of three dogs are welcome. 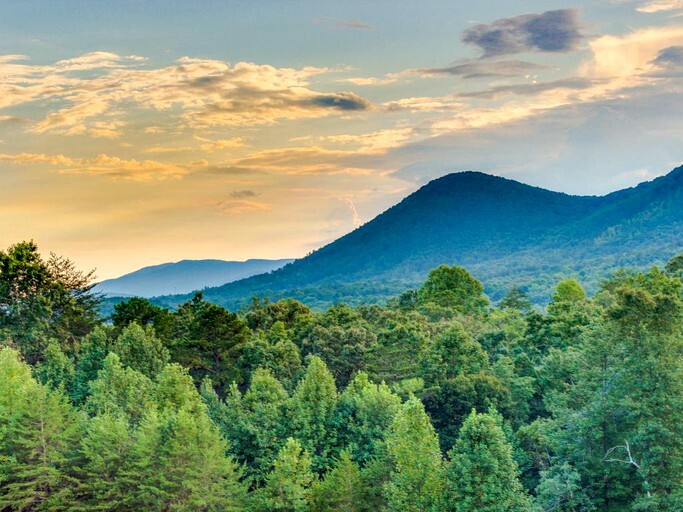 4WD/traction for a vehicle may be required in winter months. 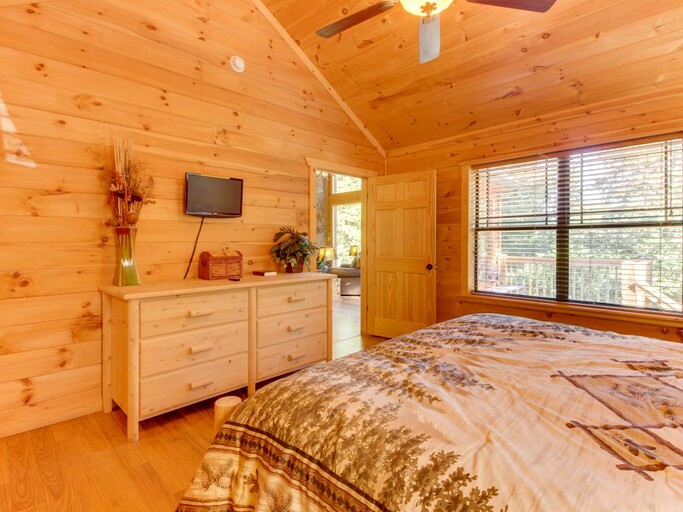 All guests must be at least 25 years of age, with the exception of multigenerational families.